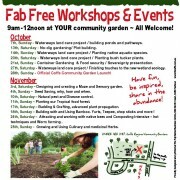 « Come on down to our free August winter workshops and events! Print article This entry was posted by Matt on November 10, 2012 at 7:15 pm, and is filed under Combine St Community Garden, Events & Workshops. Follow any responses to this post through RSS 2.0. Responses are currently closed, but you can trackback from your own site.